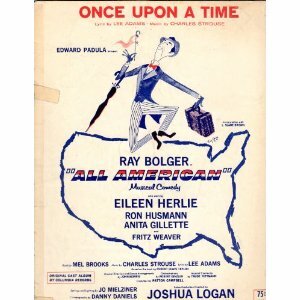 “Once Upon a Time” was written for the 1962 Ray Bolger musical All American, where it was introduced by Bolger and Eileen Herlie. While the musical was not a major smash hit, the song is quite lovely. In addition to Tony Bennett’s fine recording, it was also recorded by Frank Sinatra, Andy Williams, Howard Keel, Bobby Darrin and Mandy Patinkin. “Once Upon a Time” was recorded January 23, 1962 and released in 1962 on the album I Left My Heart in San Francisco. It was arranged by Marty Manning. “Once Upon a Time” was recorded on April 8, 1964 and released in 2011 on Tony Bennett Live at the Sahara: From This Moment On, as part of the 2011 Complete Collection. It was arranged by Ralph Sharon.